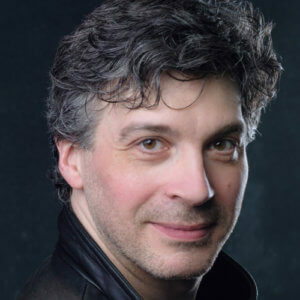 We caught up with Joshua Bloom ahead of his appearances in our Beethoven Symphony Cycle at Saffron Hall and the Barbican in May. Joshua will sing Gerald Barry’s passionate The Conquest of Ireland, which will be paired with Beethoven’s thrilling “Pastoral” Symphony. Performing in Antony McDonald’s production of Gerald Barry’s The Importance of Being Earnest for Opera Northern Ireland. An absolute joy from start to finish. At home, making coffee on my commercial espresso machine and listening to vinyl records. Becoming mortally ill before I’ve had the chance to do everything I want to do in life. Conducting along to a cassette tape of the highlights of Le Nozze di Figaro. I was probably about seven. My oldest friend Martin from Australia. Just an incredible human being. Drying on a line in The Rake’s Progress in Sydney on opening night and having to be prompted from the pit. My Oracle Delphi Mk.V turntable. Saying, “Look” and pointing at people during heated discussions. Staying up until 3am drinking whisky by myself. Comedian Stewart Lee and actor Tom Baker. Walking, reading, listening to music. Try to be kind and generous to everyone. I’m not a spiritual person but I do believe in karma. Do the best you can at everything you set your mind to, and try to be a decent human being. Tickets are on sale now for Beethoven Symphony No. 6 (“Pastoral”), with Joshua Bloom performing Gerald Barry’s The Conquest of Ireland at Saffron Hall (20 May) and the Barbican (24 May). Find out more about other concerts in the Beethoven Symphony Cycle here.